Location: No.178 Dongbei Street Pingjiang District, Suzhou City, Jiangsu Province. Ticket: CNY50 in low season (Oct.31st-Apr.15th) and CNY70 in peak season (Apr.16th-Oct.30th). Best time for visit: April - October (with azalea show and lotus show). Eulogized as one of the Four Most Famous Gardens of China (the other three are Summer Palace of Beijing, Imperial Summer Villa of Chengde and Lingering Garden of Suzhou), the Humble Administrator’s Garden is the largest as well as the most famed in Suzhou and contains almost all the features of classical Suzhou gardens. 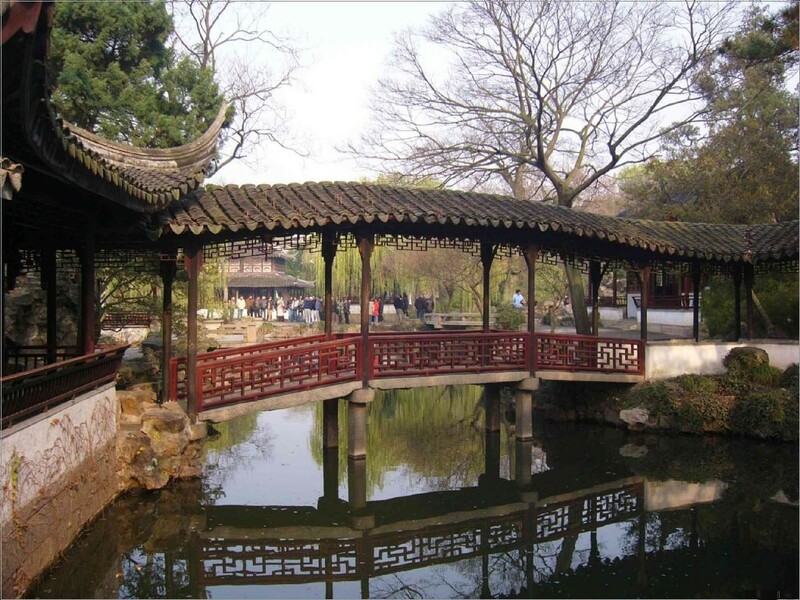 Has been inscribed as a World Heritage Site by UNESCO in 1997, Humble Administrator’s Garden is celebrated by its exquisite layout of pools, rockeries, islets, bamboo grove, pines, pavilions and corridors. 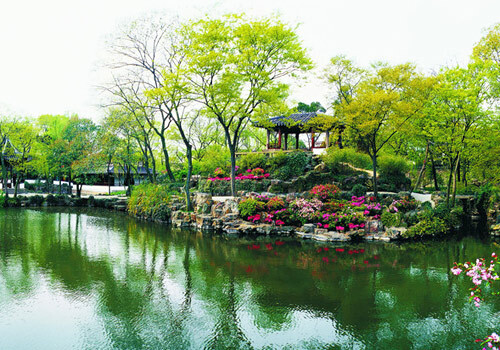 It is the representative and example of classical gardens in the south regions of the Yangtze River, and hailed as the "mother of Chinese gardens". Constructed on a former site of a residence of Tang poet which then rebuilt as a temple in Yuan Dynasty (1271-1368), the Humble Administrator's Garden was originally built in 1509 during Ming Dynasty (1368-1644). 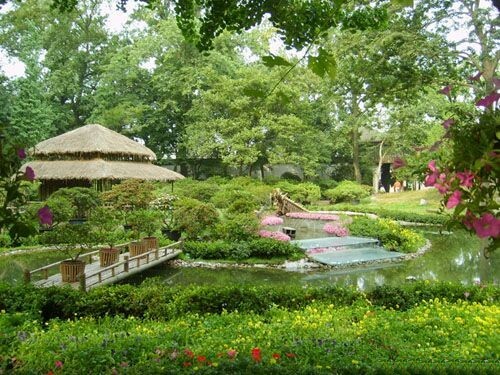 It was completed for 16 years by Wang Xiancheng, who retired from his official career and had famous painter Wen Zhengming design the garden with concepts of poetry and traditional Chinese painting. Compared himself a humble and took gardening instead of the government affairs as his business, the founder named his garden as Humble Administrator's Garden. However, after the owner’s death, his son lost out the garden in a gambling to Xu family. And for over 500 years, the garden has undergone numerous changes and divisions as private garden, or government offices, or dwellings. It is till 1950s that the garden was reunited eventually by the government. Covering about 52000 square meters, most of the architectures in Humble Administrator’s Garden were built in 1850 when it served as the palace garden of the Taiping Heavenly Kingdom (1851-1864). And in late Qing Dynasty (1644-1911), the garden has developed to present three characteristic parts, the Eastern Garden, Western Garden and Central Garden. Occupying about 12350 square meters with one third covered by waters, the Central Garden is the essence of the Humble Administrator's Garden. Pool-centered, watersides halls, chambers and pavilions are built in the flavor of the south of the lower reaches of the Yangtze River. According to the recording pictures of Qing Dynasty, the layout style of the garden is basically reserved as its original one in Ming Dynasty. Yuanxiang Hall (远香堂, Drifting Fragrance Hall) is the main architecture of the Central Garden as well as the whole Humble Administrator’s Garden which influences the layout of all other various architectures. Located on the southern bank of the pool and facing two islets in the east and west, the Yuanxiang Hall is in square rebuilt during the rein of Emperor Qianlong (1735-1795) on the original base of Ming Dynasty. Equipped with french windows in four sides, the Yuanxiang Hall can fully introduce in surrounding sceneries. 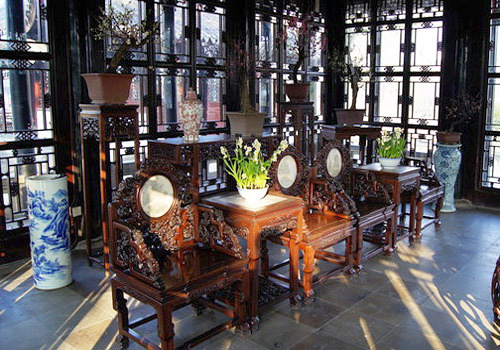 The furnishings inside are classical elegant and on the central of the hall is a horizontal inscribed board of the hall’s name inscribed by Wen Zhengming, the designer of the garden. In the south of the hall are waters, rockeries and a bamboo grove, while in the north is a spacious terrace connecting a lotus pool which offers flourishing lotus flowers and faint scents in summer. 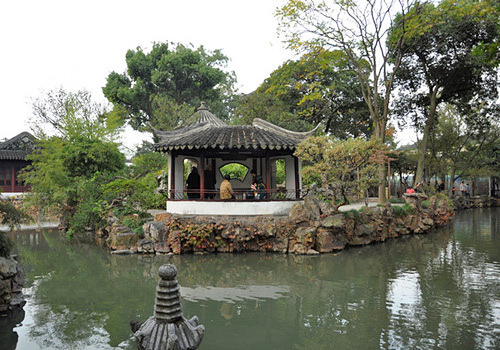 Furthermore, the north area is also the main scene of the Humble Administrator’s Garden; it has two hills with a pavilion on the west one, which possesses an inscription by Ni Yunlin, one of the four most famous painters of Yuan Dynasty (1271-1368). In the east, it is the hill which embraces numerous scenes of the garden, such as Loquat Garden, Exquisite Hall, Jiashi Pavilion, "Listen to the rain" Pavilion, and so on. 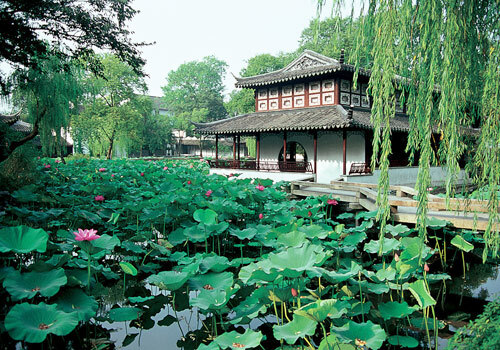 In the central of the pool, there is a Pavilion in the Lotus Breezes, in the south of which is the only gallery bridge in all Suzhou gardens. 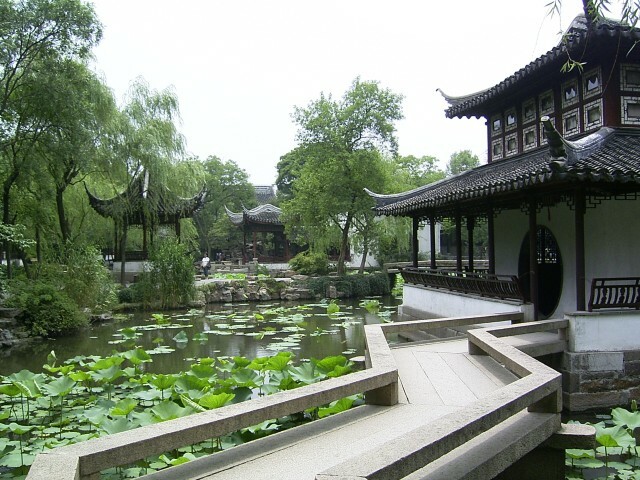 In the gardens of Humble Administrator's Garden, the names of many buildings are related to lotus because the lotus is a plant with pure and lofty character in Chinese culture. And the founder Wang Xiancheng wanted to express his aloof from politics and material pursuits as lotus. Covering about 20670 square meters, most of the scenes in Eastern Garden are new constructions. 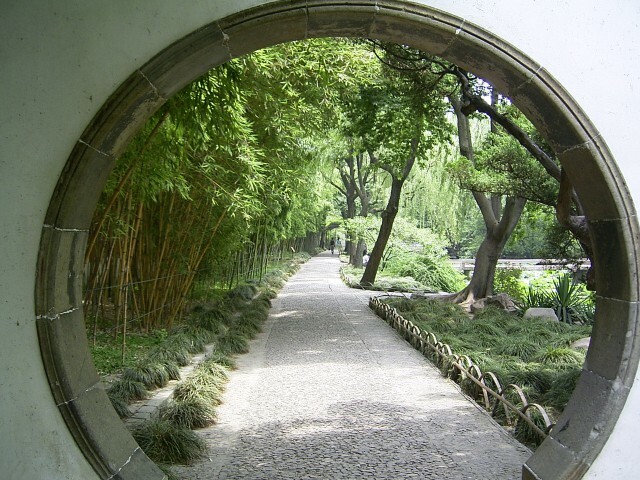 It is in the south to enter in the garden after passing a porch, a front courtyard, and a Lanxue Hall. In the east of the garden is a large lawn and in the west is the earth pilled hill with a pavilion. Streams, willows, rocks, peaks, waterside pavilions and curved bridges compose a beautiful painting which can be reflected in kinds of delicate traceries. In the northwest, there is additional a grove of Chinese ash, in the west of which is the Shuxiang Hall, an elegant teahouse. Occupying 8350 square meters, the Western Garden is similar to the Central Garden in the layout of waters and rocks. Built near the hills and by the pool, architectures are in the mature style of Qing Dynasty, and fluctuating and winding verandas and brooks are the excellent creations of Suzhou gardens. The 36 Yuanyang (Mandarin Duck) Hall (三十六鸳鸯馆), the main building of Western Garden which is delicate decorated with fine furnishings, was the site for feting guests and enjoying operas in the past. During sunny days, the outside scene reflects in through the blue glazed window just likes a beautiful snow-covered landscape. Another famous architecture of Western Garden is a small and exquisite fan-shaped pavilion, Yushuitongzuo Pavilion (与谁同坐轩, "With Whom Shall I Sit" Pavilion), which provides a preferable scene of the garden.